Cameron Becomes Prime Minister After Brown Quits The 43-year-old Conservative leader became Britain's youngest prime minister in almost 200 years Tuesday. The queen asked him to form a coalition government less than an hour after Labour's Gordon Brown tendered his resignation. Brown's departure ended 13 years of Labour Party rule. 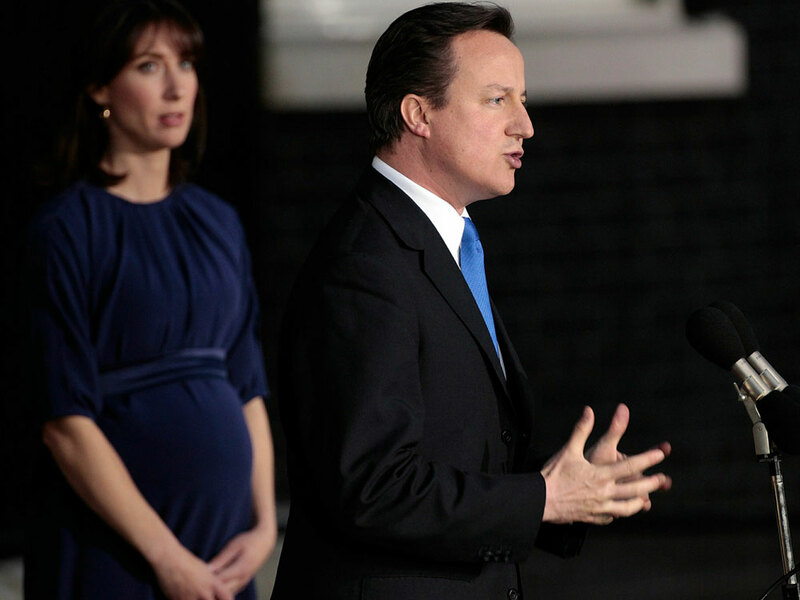 Conservative leader David Cameron, with his wife, Samantha, speaks to the media after becoming British prime minister on Tuesday. Conservative Party leader David Cameron has become the youngest British prime minister in almost 200 years after Gordon Brown resigned Tuesday. Brown's departure ended 13 years of Labour Party rule and came after the party's main political rivals put the finishing touches on a coalition agreement. Cameron, 43, whose Conservative Party garnered the most votes in last Thursday's inconclusive national elections, was summoned to Buckingham Palace by Queen Elizabeth II and asked to form a government less than an hour after Brown's resignation. Within minutes, Cameron was installed at No. 10 Downing Street and an announcement followed that Nick Clegg, leader of the Liberal Democrats, would become deputy prime minister after days of hard bargaining with his former political rivals. Clegg and four other Liberal Democrats received Cabinet posts. A number of other Liberal Democrats would receive junior posts. David Cameron, 43, was elected Conservative Party leader in 2005, after just five years in Parliament. Cameron comes from a prominent banking family. He attended the exclusive Eton College boys' preparatory school and graduated from Oxford. Under Cameron's leadership, the Tories have shifted focus to social issues such as Britain's National Health Service, the school system and the environment. The Conservatives picked up 100 seats in the election but still fell short of the 326 necessary for an absolute majority. An alliance with the Liberal Democrats, who have 57 seats, puts them comfortably in control. Britain's current system favors the two main political parties, and the Liberal Democrats want changes that would give British voters proportional representation. The coalition has already agreed on a five-year, fixed term Parliament -- the first time Britain has had the date of its next election decided in advance. Both sides have made compromises, and Cameron has promised Clegg a referendum on his key issue: reform of Britain's electoral system aimed at creating a more proportional system. "We are going to form a new government -- more importantly, we are going to form a new kind of government," Clegg said in a news conference after his party's lawmakers overwhelmingly approved his decision to enter a coalition with Cameron. Earlier, speaking to reporters outside the prime minister's residence in London, Brown said, "It was a privilege to serve." The Labour Party finished a distant second to the Conservatives. Cameron said in remarks at 10 Downing St. that he and Clegg would "put aside party differences and work hard for the common good and the national interest." The Conservatives said ex-leader William Hague will serve as foreign secretary, senior lawmaker George Osborne will be Treasury chief and lawmaker Liam Fox defense secretary. For Brown, the resignation marked the end of a three-year tenure as prime minister, during which his country suffered the deepest recession since World War II. The 59-year-old prime minister saw his popularity plunge over public worries about the economy, the wars in Iraq and Afghanistan, and an expense scandal in Parliament that tarnished members of both major parties.